Recently, I attended Klaviyo’s first ever email marketing conference in Boston and while I was there, I recorded a bunch of podcasts. 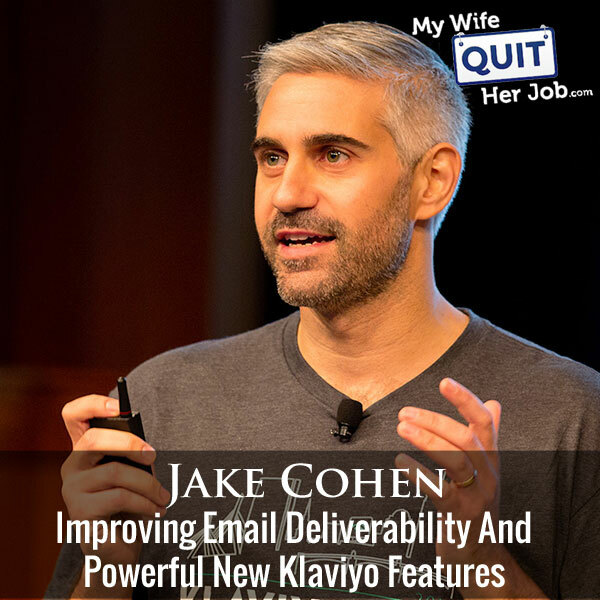 Today’s episode is with Jake Cohen who is the director product at Klaviyo and an expert on email deliverability. In this episode, we discuss some of the awesome features Klaviyo just released but the best part are the nuggets that Jake provides on how to improve your email deliverability. These are strategies that I was not aware of and I’m definitely going to change things up. Privy.com – Privy is my tool of choice when it comes to gathering email subscribers for my ecommerce store. They offer easy to use email capture, exit intent, and website targeting tools that turn more visitors into email subscribers and buyers. With both free and paid versions, Privy fits into any budget. Click here and get 15% OFF towards your account. Pickfu.com – Pickfu is a service that I use to get instant feedback on my Amazon listings. By running a quick poll on your images, titles and bullet points, you can quickly optimize your Amazon listings for maximum conversions. Click here and get 50% OFF towards your first poll. Steve: You’re listening to the My Wife Quit Her Job Podcast, the place where I bring on successful bootstrapped business owners and dig deep into what strategies they use to grow their businesses. Now recently I attended Klaviyo’s first ever email marketing conference in Boston. And while I was there, I recorded a bunch of podcasts. And today’s episode is with Jake Cohen, who’s the Director of Product over at Klaviyo and he’s actually an expert on email deliverability. And in this episode, we discuss some of the awesome new features that Klaviyo just released. But the best part of the show to be honest with you, are the nuggets that Jake provides on how to improve your email deliverability. These are actually things that I did not know. And I’m going to be changing up some of my email strategies for sure after this interview. But before we begin, I want to give a quick shout out to Privy who is a sponsor of the show. Privy is the tool that I use to build my email list for both my blog and my online store. Now they’re a bunch of companies out there that will manage your email capture forms, but I like privy because they specialize in e-commerce. Right now I’m using Privy to display a cool wheel of fortune pop-up. Basically a user gives their email for a chance to win valuable prizes in our store. And customers love the gamification aspect of this, and when I implemented this form email sign ups increased by 131%. So bottom line, Privy allows me to turn visitors into email subscribers, which I then feed to my Klaviyo to close the sale. So head on over to Privy.com/Steve, and try it for free. And if you decide you need some of the more advanced features, use coupon code MWQHJ For 15% off. Once again that’s P-R-I-V-Y.com/Steve. I also want to give a shout out to Klaviyo who is also a sponsor of the show. I’m always blessed to have Klaviyo as a sponsor because they are my email marketing platform that I personally use for my e-commerce store, and I depend on them for over 30% of my revenues. Right now Klaviyo has a special offer to help ecommerce businesses like yours prepare for the holiday season. From planning your email schedule to creating powerful holiday target segments, Klaviyo is actually offering their expertise for free. So go to Klaviyo.com/BSCM and sign up for a free holiday strategy assessment. This assessment will be geared towards the needs of your business, chock full of strategies and tactics that will help you make more money, so sign up now for free at KLAVIYO.com/BSCM, now on to the show. Steve: Welcome to My Wife Quit Her Job Podcast. Today is day two of the Klaviyo conference in Boston and I was lucky enough to have Jake Cohen with us from Klaviyo. He gave an excellent keynote this morning on the brand new features that Klaviyo is introducing. And just to be upfront with you guys, normally I don’t actually go on a podcast and talk about new features of just some random tool. But I really felt that these brand new features are actually very compelling and it actually makes Klaviyo like light years ahead of anyone else that’s out there and I have the man himself here to explain these features. And one thing okay, I just want to start with this one feature that really made me excited. Steve: If you could just provide some like practical applications of this in case I got too technical for the audience there. Jake: Yeah, I’ll try to not get more technical, teasy with that kind of thing. Great summary by the way, that was really good. You’re totally hired. Yeah, that’s the idea, right? So when we’ve talked to a lot of different customers and there’s these kind of buckets of information that they have that they want to use in their marketing. So you’ve got your customer data, things you know about different people, your sales data, and then your marketing engagement data. And then there’s this kind of other bucket, which is it tends to be very business specific. Probably the most common thing which we talked about today is gift cards. And so like lots of businesses have gift cards, it’s a great way to get some revenue in before you know what you want to buy. But what ends up happening a lot of times is people will get a gift card, but they won’t necessarily spend all of it or they’ll forget that they have it right. Jake: Well, so here’s the interesting thing, maybe not, right. So that’s breakage is what you’re talking about. Breakage isn’t necessarily bad. You don’t have to give anything away, you got cash. Sure, I know that that’s like a viable long term business strategy. People don’t ultimately spend money. But it’s certainly not the worst problem you could have. Instead, what we found when we talk to store owners, is that when someone has a gift card, there’s certainly a percentage of people that only spend that gift card amount, and then pay for shipping. But a larger percentage of people actually use it to buy more items than they would have in the past to try more things. And in that case, you start to build the relationship where someone can try your inventory, try your products; hopefully, they said they liked it, because you have good products, and then they come back and buy again. And the gift card just kind of makes it easier to start that next phase of the relationship where they become a purchaser. Steve: Okay, so what is this customer object API? How does that solve the gift card problem and getting them to redeem the card? Jake: Yeah, so gift cards are objects is the technical term. And the way this API works is, you can pass us anything you want. So you can say, like, I want to share with you that there is a gift card, when it was created, how much is on it, and the last time that the value changed. And so what you could do is, when you pass that over to us, what we do is we expose that in the UI. So without being someone who is an engineer that’s looking through all the different databases and writing, command line scripts to try and get stuff out, you can literally say, hey, I want to trigger a flow when the amount of the gift card changes. And then you want to say, like, hey, I noticed you spent something, and you could put a filter and say, if the gift card value is above zero in 30 days, I want to send an email and say, like, hey, you have this much money left, and put some recommended products right in the email. And so what ends up happening is you’re taking into account this very specific piece of information about your business, and you’re creating an opportunity, a moment to help your customer basically benefit, because they forgot about something, and they’re going to save some money on their next purchase. Steve: And I would imagine that there’s scarcity in this gift card. And chances are people are going to spend more than what’s on the gift card, right? Jake: That’s what we find yeah. Steve: And that’s really powerful. And I would imagine, once this is out, there’s going to be just all these Shopify apps and whatnot that automatically take advantage of this, right. So really, there’s not going to be any coding involved. Jake: For like a store owner. Steve: For like a store owner. Jake: No, in fact, the way that we’ve designed the feature — so what — there’s only a limited time when I’m up there so I can only share so much. One of the things that’s part of this work is we’ve extended the flows feature, the template editor and the different campaigns too so that you can automatically select for example, a trigger from a custom object to start a flow. So as soon as the data is in right, you can access it through the regular UI that you would have within Klaviyo and you can just like easily whip that up and take advantage of it in the same way that you would from a placed order event or any other piece of information. Steve: To get them to buy more. Jake: As one example yeah. Steve: Just as a simple example yeah, but it’s going to be a lot more powerful than that for geeks like me, especially. Steve: You call me geek? Jake: Me too, we’re in good company. Steve: Yeah. The other thing I thought that was actually really cool was the analytics, the additional analytics of Klaviyo. I know there’s a whole bunch of slides. Steve: I don’t know if you want to just kind of give a brief overview of what you think that the majority of store owners out there will be concerned about. Jake: Yeah, so this is — I’ve spent a lot of time thinking about this. I think in April of this year, maybe March or April of this year, we got a lot of feedback, we did like a big poll with all of our customers. And we were like; if you could change one thing about Klaviyo and make it better what would it be? And like resoundingly, it was reporting. People were like, man, you just can’t see anything in the product, you have all my data, you make it impossible to see. And we were like, we most definitely need to solve that. So the customizable analytics feature, which is when you come on the dashboard, there’s a series of tabs, one of them is analytics. We designed it in a way that’s completely customizable. So we’ve built some default dashboard. So we’ll show you the things that we think are important, so you don’t have to work very hard. But if you’re specific about seeing the data that you want, within a certain time interval, or a certain time range, or you want to see certain metrics that matter to you most in a certain order, like if you can just drag it all around and switch everything up you want and like you’re done. And so, we’re actually really excited about this, because if you look around at other platforms that sort of give you some reporting on how things perform, there’s one of two problems. The first problem is it’s incomplete. So you don’t really get good views, you get some views. And then you’re like, hey, what should I do? And they say, oh, well, you can export a CSV and spend your life in Excel. And then you can find what you want, which is not helpful, or it’s a very technical experience, where you have to basically understand how to work within a Redshift cluster and write cron jobs that are going to go like clean everything up and then automatically work with a visualizing tool so you can go see and it’s like, who the heck wants to do all that stuff, right? And so we tried to take approach where, like, you don’t have to work hard, and you can be as flexible as you want. And what we also announced which is coming which I’m really pumped about is the Report Builder. So as an extension of customizable analytics, you can just see what you need to see. We think there’s kind of this other bucket of analytics where people have these sort of more sophisticated, more robust, more specific questions. So they want to know hey, when someone buys – I’m making up an example, if someone buy shoes first, what’s the thing that they most often buy next? It’s actually really hard to understand without buying some other service that’s going to integrate all your stuff and then it’s like crazy, but we already have all the information. So, we just have to give you guys an experience where you can basically select a couple of inputs to get a report out. And what I didn’t announce because it’s coming later is we’ll add visualizations to that too. And so eventually you’ll get this experience where you can have a really sophisticated question, you can store that and then you can go see it anywhere you want, and so it becomes a really dynamic experience where all your data is at your fingertips and it will tell you anything that you want to know, you just have to ask. Steve: Is that they’ve allowed you to extract all of your sales information and generate your own reports and it’s just really powerful, and you have infinite freedom to look at whatever key component that you’re looking at. Jake used the example of shoes, maybe you can say hey, tell me what other products were bought with shoes, all that stuff you can just generate reports on the fly and get accurate data for. Jake: Nailed it yet again [overlapping 00:11:27]. Steve: Data science team right, they can now predict based on customer behavior how much money a particular customer is going to spend in their lifetime. And then you can create segments in your email for this and then use that for Facebook ads to create lookalike audiences. I’ll let you explain since I’m clearly not the expert, I’m just — all this stuff I’m talking about is what I gathered from your presentation. Jake: Yeah. No, no, no, it’s great. So yeah, so we hired — yeah, this data science team, they’re awesome. And there’s a series of really, really good blog posts that they publish, that explains the models that they created, the experiments that they went through, how they went to figure this out, because it’s a bit of it, it’s kind of a journey, it’s a little bit of a wild west industry where everyone says they have the answer. But it’s math, right. So it’s like, let’s publish the math and let’s talk about it and make sure it’s right. And so that’s the approach that these guys take, which I love. What they basically figured out is if you look across the aggregation of customers within your account, the likelihood that any of them will spend, how much they spend, and how frequently you can distill that and apply it to an individual profile to help understand how you specifically might spend. And so what they’ve done is made projections for the next year for every single profile in your account of what they’re going to spend. And what we do is when you want to gather that information; we compute it on the fly every time you want, because every time there’s a purchase, or a new customer, the model changes the results. So it’s the most up to date information every second that you go use it as opposed to something gets stored and stale after a long period of time. So that’s how it works. Steve: What do you see are some main practical applications that store owners can use with this information? Jake: The one that I like the best, which is one of the ones we talked about is you can take your predicted lifetime value, this is exactly — okay, here are a set of steps of what I would do right now. If I was running a store, number one, I would take, I’ll create a segment of all the profiles in my account, which is just email address has an ad sign in it. I would export that and I would select all the predictive analytics. Once I had that out, I would look at what the average lifetime value is, and then I would take the top 20%, when you spend it out, I’d figure out what that number is, and I’d build a segment of anyone who’s predicted lifetime value is above that number. Once I had that, I would do exactly what you said, I’d integrate with my Facebook ads account, I would turn that into a custom audience, I’d build a look like audience and I would target them with an offer to try and get them to come into my store if I did offers, if I did just, whatever, some call to action to acquire them. And I track how that’s performing over time. And like, guarantee you’re going to get some good people that way. And these are going to be like your best customers long term, who will buy from you over and over and over again? Steve: Yep. And I would imagine you would also send out an email campaign to those people alongside of the Facebook ads, right? Jake: So it’s a more loaded question. It depends on what your campaign strategy is. I probably would not recommend just like, here’s your list, go send something. Again, our sort of big vibe, and spirit here is like, you want to build more personal connections over time. What I might want to do is, if I were having a big sale, or a big product launch, where I was going to talk to every single one of my people anyways, sure, I might stagger my campaigns. And I might start with these top spenders and see how much revenue I can generate just focusing on them and have the content speak to hey, we noticed that you’re an amazing customer and we appreciate all your business. And so we’re literally sharing this with you first, and everyone else is going to get it next week. So like limited supply, get it while it’s hot, and I bet you’ll see a lot that way, then you can start to open it up to everyone else. And yeah. Steve: One thing that I’ve noticed in terms of deliverability is if I email someone who’s much more likely to open an email, then my overall deliverability works better. So what I do is I email the guys who really love me, and then the guys who are less engaged I know, like at some point later, I would imagine you can apply that here as well right? Email your highest lifetime value customers first. Jake: Yeah. So this is cool. I’m the deliverability guy and so you’re. This is perfect; we’ve unlocked this amazing treasure chest of fun things. Steve: I hope the audience is interested Jake, so let’s not – we could go all day on this. Jake: Okay, yeah, so the thing that’s interesting, that’s a little bit counterintuitive about deliverability, so this is when the inbox clients make a determination as to whether or not to deliver your message. The inbox clients don’t know anything about your sales, and they don’t care. And so, what’s fascinating about this is we as store owners are like, but wait a second, someone who buys from us is obviously interested, they’re obviously engaged. But from an email perspective, they might never open an email. And in fact, you could be harming your deliverability by sending to people purely on the basis of whether or not they’re a customer and not on the basis of whether or not they engage with your the emails, because the inbox providers don’t know. Steve: Okay, send me the link; I’ll link it up in the show notes. Jake: Yeah, totally. Different inbox providers, sort of like signal different things. And so for example, Hotmail, if you send to people who have not opened in the last six months, they will flag you, and they will start to penalize your placement, because what they do is they look at engagement over that time period, not really granularity beyond that. Gmail is much, much, much more sophisticated. And so what they’ll do is if let’s say you’re a daily sender, if you send every day for 7, 14, 21days, and someone doesn’t open, they’ll penalize you for that person. And if there are a lot of people like that, they’ll penalize you overall. And only has to do with opens. And so like the best practice, and we’ve got some articles about this too, is to include in your segmentation some logic that says, like, has opened within the last depending on how frequently you send three, four or five, six months, and that will make sure that there are people who are generally engaged, so that you’ll stay out of deliverability trouble. Jake: Again, it’s kind of like how strategic you want to get. You could, there are some people that like, just don’t send campaigns to people unless they’ve opened, and they let their automated flows take care of making sure these people start to engage. Because where you get into trouble is, if you send campaigns all the time, or to a large number of people, but you’re sending to people that haven’t opened lately, that’s going to have enough signal, enough volume that the inbox is going to look at you as a sender and go, you’re bad. Your flows have a higher likelihood of being opened; always have higher open rates, because they’re triggered by events that your customers go through. And so a really, really clean strategy is you sign up a — you hook up a welcome series to a form and people start to open that. And when they open, they make their way into the segment that has the criteria has opened recently, and you can start to send those campaigns. And then you can create a flow that is sent only to people haven’t opened a long time offering them something to try and get them back into the cycle of stuff that you can send all the time. And that’s a really clean way to keep high engagement, really good positive deliverability and make sure that your emails get in front of the people who have to see it. Steve: I just want to take a moment to thank Pickfu for being a sponsor of the show. If you currently sell on Amazon like I do, then you know how crucial the quality of your Amazon listing is to the success of your e-commerce business. So for example, I’ve run experiments on my Amazon listings, where simply replacing the main image with a different photo resulted in a 2X increase in conversions. But how do you choose the best and highest converting photos for your listings? How do you know that you’re using the most profitable images for your products? And how do you know that your bullet points are convincing? This is where Pickfu comes in. Pickfu allows you to solicit real human feedback about your Amazon listings in 10 minutes or less. And you can target the exact demographic of your end customer. So for example, let’s say you sell napkins and you have two main product images that you want to test. You would simply go to Pickfu, list the images, target female Amazon Prime members over the age of 35 and hit go. Within 10 minutes you’ll get feedback of which image people are more likely to buy along with specific feedback on why they made their decision. In fact, I’ve used Pickfu to almost double the conversion rate on several of my Amazon listings by testing my images, bullet points, and product titles. And what I like about Pickfu is that you get results quickly unlike traditional split testing, and you can use this to test book covers, landing pages, basically anything. Not only that, but it’s super cheap to run a poll and right now you can get 50% off your first poll by going to Pickfu.com/Steve, once again, that’s P-I-C-K-F-U.com/Steve. Now back to the show. Okay, that’s fantastic. I did not know that. Steve: You didn’t even cover this in the speech this morning. Steve: This is the other stuff. Well, let’s go back to some of the cool features that actually destruct my eye. One of them was the ability to actually change your store, depending on behavior within Klaviyo, right. So I think the example you used was, if it’s a guy and I ended up shopping, and I signed up shopping for men’s clothing, the next time I come on, I am shown men’s clothing. Jake: Oh, you mean the dynamic web personalization. Steve: Yeah. So how does that work exactly? Jake: So this isn’t released yet. This is the next big thing that we’re working on. But the way it will work is using the information that we collect on your behalf about people, whether they’re men, whether they’re women, whether they’ve looked at certain products, or purchased certain products or certain collections, that kind of stuff, our recommendation engine will pull out, and this works for emails today, we’ll pull out some of the products that we think fit for that person. And it roughly works by pulling best selling products, excluding stuff that they’ve purchased in the past, and then reordering it based off of stuff that they looked at, or purchased. And what will happen is, depending on the logic that you set up, when someone comes to your site, we’ll know who you are, because we will have cookied you, and you will have signed up, and we’ll have this information. And you could have a widget kind of show up on your screen that says, hey Steve, we recommend the following things, we think these are right for you. And so as a consumer, you have this experience where you feel like someone is actually doing some hand-picking if you will off products that are right for you to both increase the personal experience that the store can give you, but also increase the likelihood that you buy it, which is good for the store too. Steve: Cool. So this feature is not released it yet? Do you have any, like preliminary data from live shops that you kind of bating this with? Jake: No, we’re in the design phase with this right now. So the feature that we talked about this morning, where you can target list and segments for forms, there are some really rich underlying technology there that’s going to be used for the onsite personalization. So, we’re designing the right experience to get this live right now. But we’ve got the sort of core tech in place to make it happen. And so that’s where it’s at, we expect it will be coming out in the month — next, probably, like one to four or five months, something like that. Steve: Okay, Jake, the reason why I’ve been kind of rushing through this interview a little bit is because I know you have to speak in a little bit. Steve: Do you know how much time you have left? Jake: What time is it? Steve: It’s 3:11 right now. Jake: I probably have to go. Jake: Let’s do a couple more minutes. Steve: A couple of minutes, okay. So I want to get back to deliverability because it actually applies to everyone who’s listening. Steve: So you mentioned that one flow where you’re using your automated flows to determine who you should send a campaign to. Are there any other tips that you have to improve deliverability? Jake: Honestly, there’s two things. One, every three or six months, there’s a pretty healthy group of profiles that you should probably suppress, which means like unsubscribe, like not send to anymore. This is, in my experience working with people, it’s really hard because you’re like, ah, but there’s like missing value in these people. They might buy something. And if I send a campaign, maybe one day, they’ll buy something. And it’s like, maybe, but probably not. And so it’s a good idea to build a segment of people that you’ve sent, I don’t know, 20 emails to in the past two years, but haven’t opened any, and they’re just gone, you know what I mean? And suppress those people. And the reason is when you send to them, it’s a huge signal to the inbox providers that you’re not cleaning your list. And I go to this conference called M3AAWG. It’s the — what is it, the Mail Messaging Anti Abuse Working Group. Steve: That sounds pretty geeky. Jake: It’s super geeky. It’s like the extreme gray beard under lords of email around the world, like get together and decide what to do with email. It’s wild, but they’re literally looking for ways to penalize senders that don’t respect in boxes. And so if you just think about earning the right to send the message and removing people who don’t want it, and being respectful, you’ll be in great shape. And the second thing I’d say is like, actually, don’t worry about it that much. If you use Klaviyo, we have some very high quality shared infrastructure that we have our sender send on and we are monitoring automatically every single send from every single person that we remove bad senders and promote good ones. So, we have huge volume and great relationships with the ESPs like, it’s just not something you should stress about if you’re respecting in boxes, you’ll be in good shape. Steve: So what you’re saying is when you’re sending to people who aren’t opening, that will affect your overall deliverability. Is there some sort of best practice on who these guys that you prune, what are the rules that you’re using to suppress? Jake: It kind of depends on how frequently you send, but like a good — like you can’t go wrong type of a segment is people who have received 10 plus emails in the last two years and opened none. Steve: Okay, just get rid of them, that sounds like pretty conservative. Jake: Yeah, it’s very, very conservative. You won’t like harm your business really materially in that way. And like you’ll help your deliverability. Something that’s really interesting, Josh was on a panel yesterday, he works with JackThreads. He tells a story, they had 16 million email addresses and then realized that they were all unengaged and eventually had to go down from 16 million to 5 million to 1.1 million to 300,000 to 30,000 email addresses is all they had left. Jake: And then they’ve built their list back up to 300,000. He’s making more money today with 300,000 emails than he was with 16 million. Jake: Because along the way, he got mass blocked by Gmail and put immediately in the spam folder, every single email because he wasn’t respecting the inbox. And now – oops, that’s mine, I got to go. Now he’s the biggest fan boy in the world of making sure that you respect the inbox and you send to people who want it because it works. Steve: Okay, well Jake, I’m going to let you go. You got one last talk and then you’re home free right? Jake: Yeah, this is — I mean I could do this all day, it is my favorite thing in the world to do, this is like vacation for me. Steve: All right man. Well, Jake, I really appreciate your time. Jake: Likewise, thanks for having me. Steve: All right, take care. Hope you enjoyed that episode. As you can probably tell from the interview, Jake is a total email geek and his insights on deliverability really blew me away. For more information about this episode, go to mywifequitherjob.com/episode228. And once again I want to thank Klaviyo for sponsoring this episode. Klaviyo is my email marketing platform of choice for e-commerce merchants and you can easily put together automated flows like an abandoned cart sequence, a post-purchase flow, a win-back campaign, basically all these sequences that will make you money on autopilot. And right now they’re offering free consulting, so head on over to Klaviyo.com/bfcm to sign up for free. Once again that’s K-L-A-V-I-Y-O.com/bfcm. I also want to thank Privy for sponsoring this episode. Privy is the email capture provider that I personally use to turn visitors into email subscribers. They offer email capture, exit intent, and site targeting tools to make it super simple as well. And I like Privy because it’s so powerful and you can basically trigger custom pop ups for any primer that is closely tied to your e-commerce store. If you want to give it a try, it is free. So head on over to Privy.com/Steve, once again that’s P-R-I-V-Y.com/Steve. Now, I talk about how I use these tools on my blog, and if you’re interested in starting your own ecommerce store, head on over to mywifequitherjob.com and sign up for my free six-day mini course. Just type in your email, and I’ll send you the course right away, thanks for listening. Outro: Thanks for listening to the My Wife Quit Her Job Podcast, where we are giving the courage people need to start their own online business. For more information, visit Steve’s blog at www.mywifequitherjob.com. Is there a link to the blog post that Jake mentioned regarding deliverability?